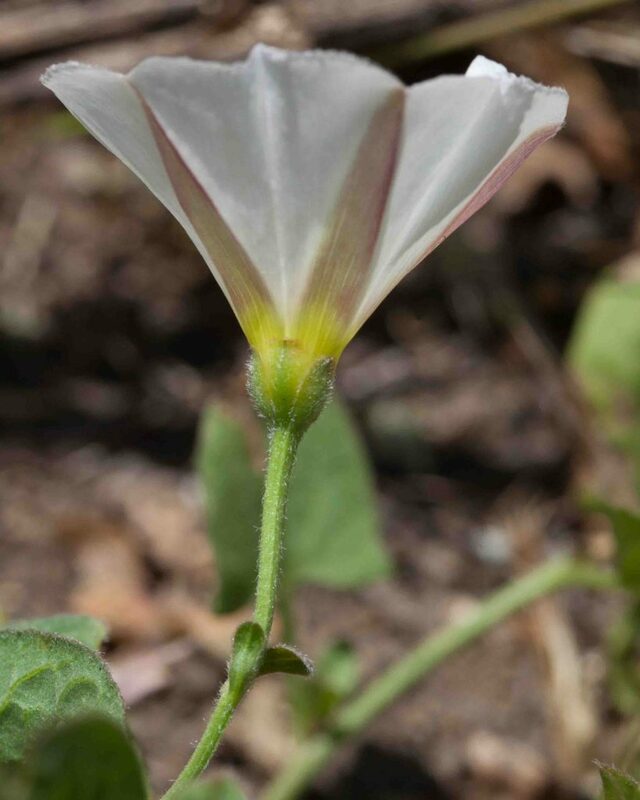 Morning-glory is immediately recognizable with its flaring white or pink or pink-striped funnel-shaped flowers. Distinguishing individual species or subspecies is trickier. 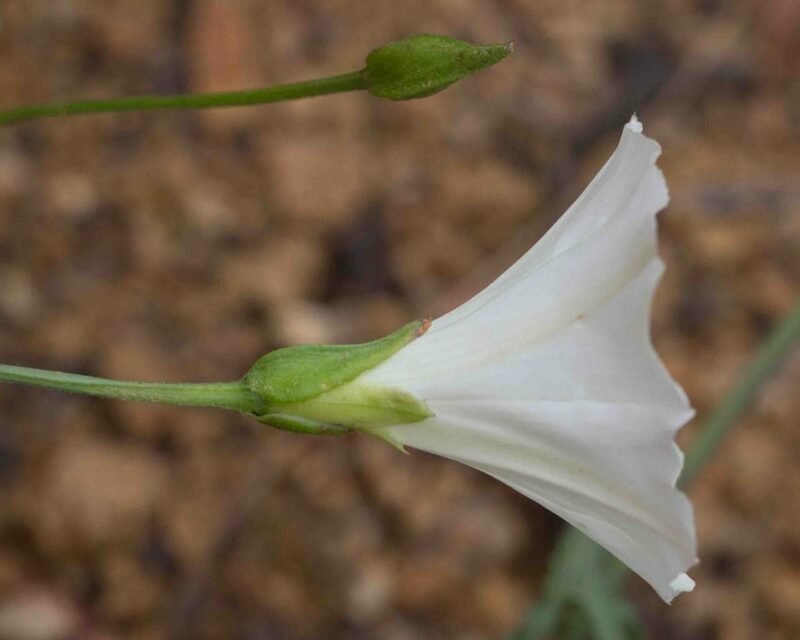 It is necessary to look first at the bracts subtending the flower; these vary significantly in shape and position and sometimes also hairiness. It is often necessary to look closely at the leaves. 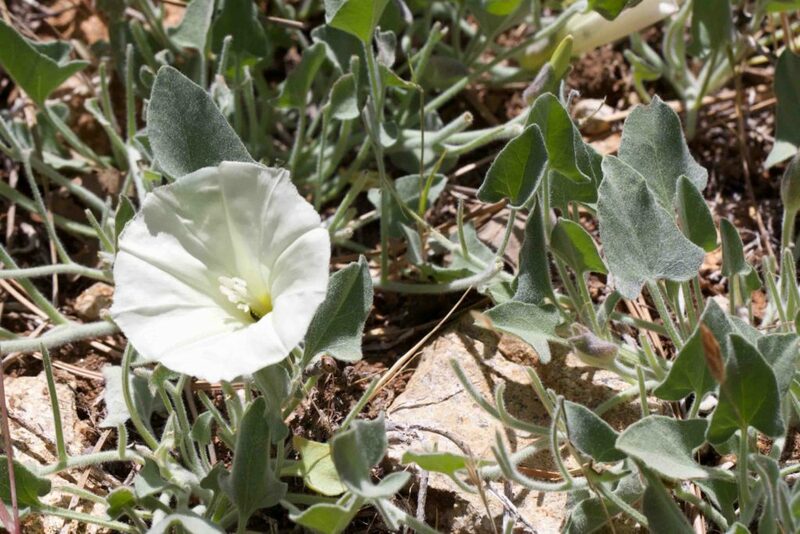 The shape of the leaves, the degree of hairiness and sometimes the shape of the “sinus”—the angle formed by the lobes at the base of the leaves—can be critical. 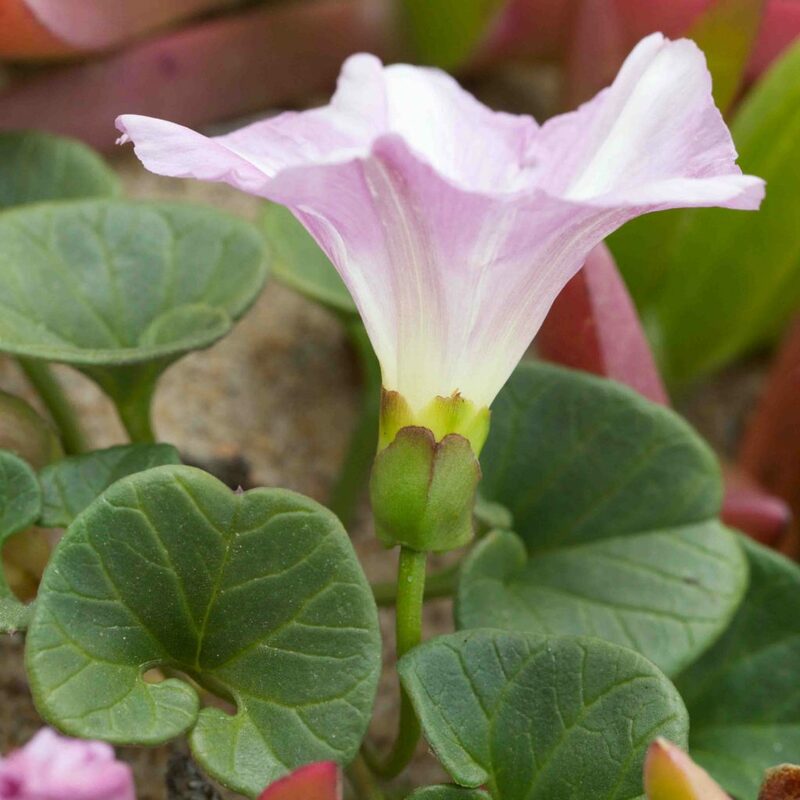 By far the most common morning-glory found near the coast, often growing aggressively in other plants. 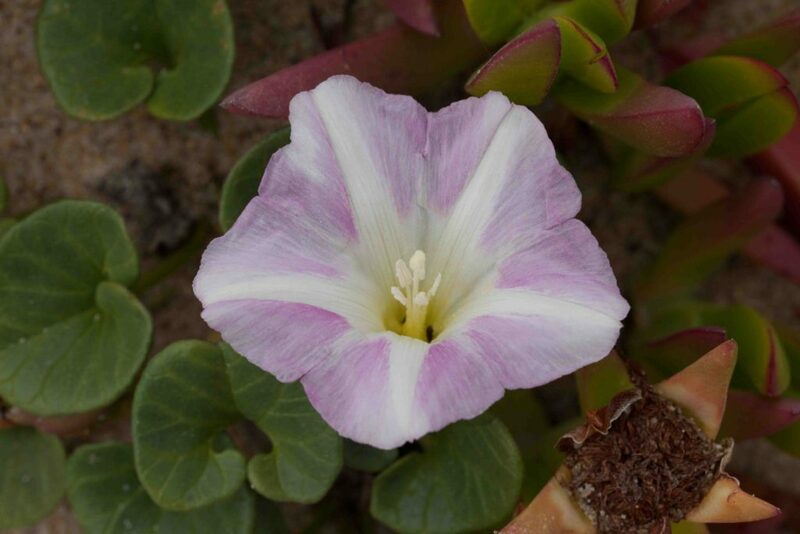 It has beautiful flowers, white to pink, funnel-shaped, often pink-striped below. 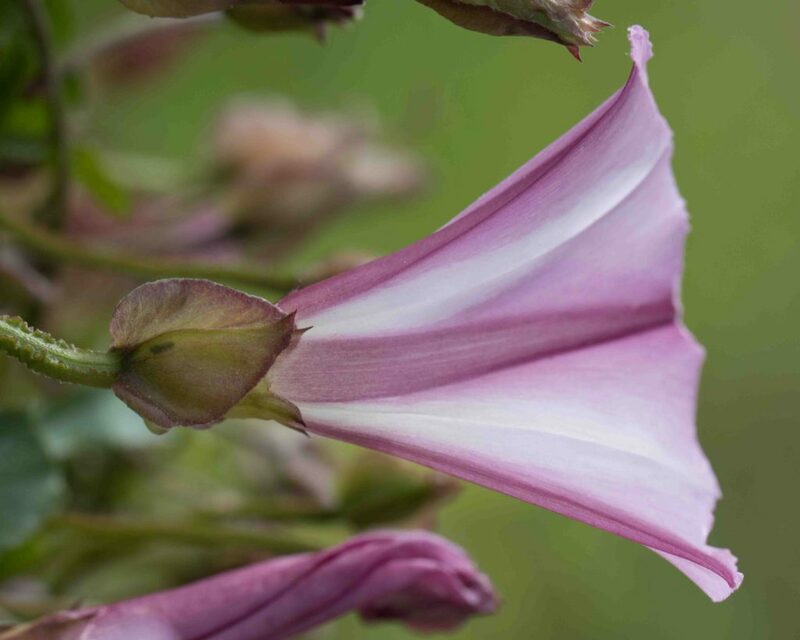 Its most distinctive feature is how its calyx is enclosed or closely subtended by a pair of large, widely ovate to rounded, sepal-like bracts with notched or narrowly pointed tips. 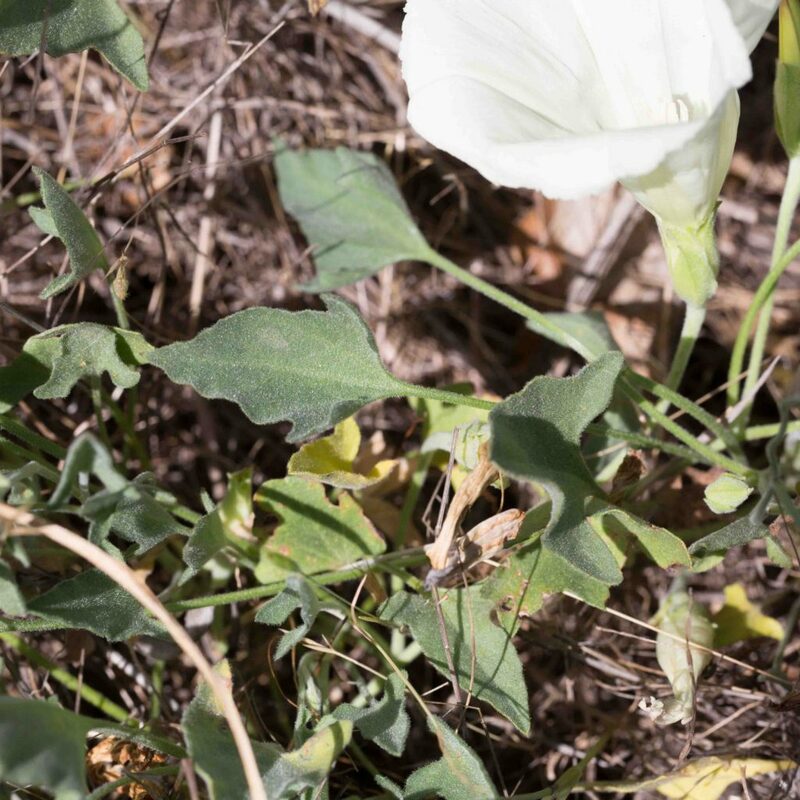 Leaves are triangular and the sinus is variable, acute, rounded or squarish. 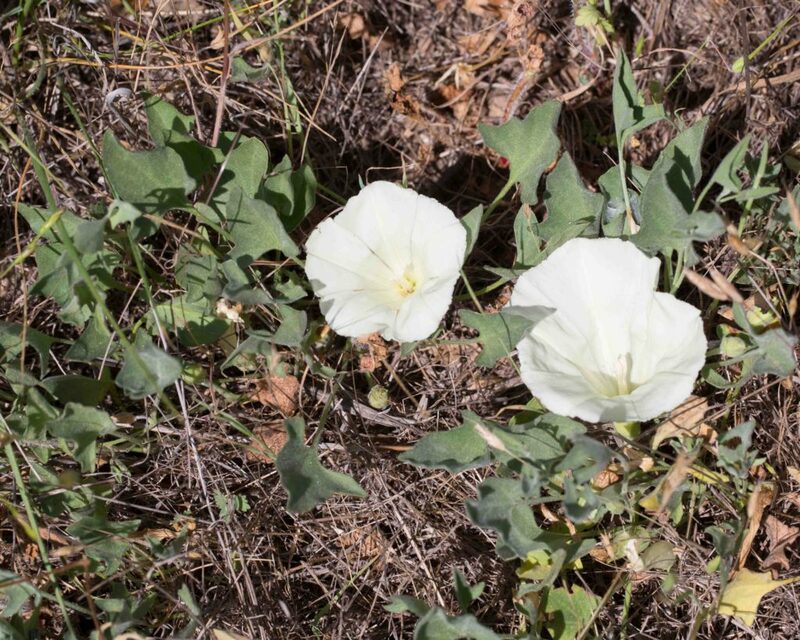 This is the most common morning-glory found on the Monterey Peninsula away from the immediate coast. It can be identified most easily by its 1–2 linear bract(s) which are a little below the calyx, occasionally overlapping but never covering it. 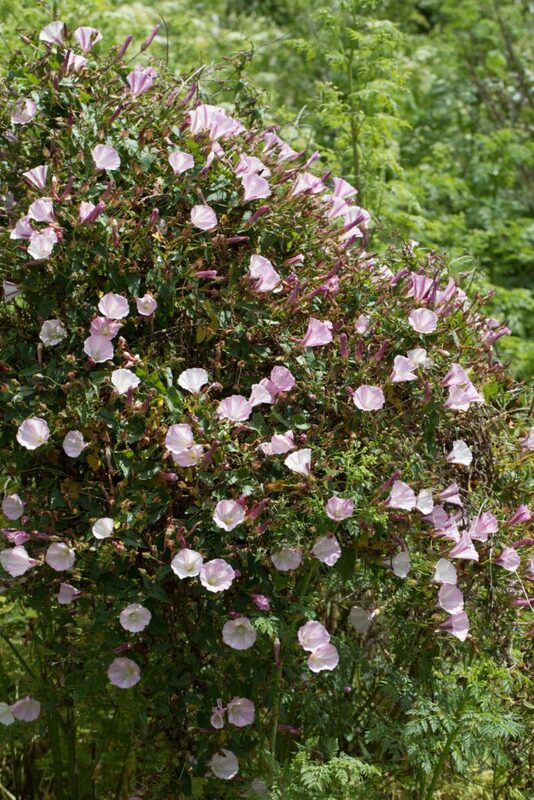 It has long peduncles, longer than the leaves. The sinuses are a deep V-shape and sometimes even closed. 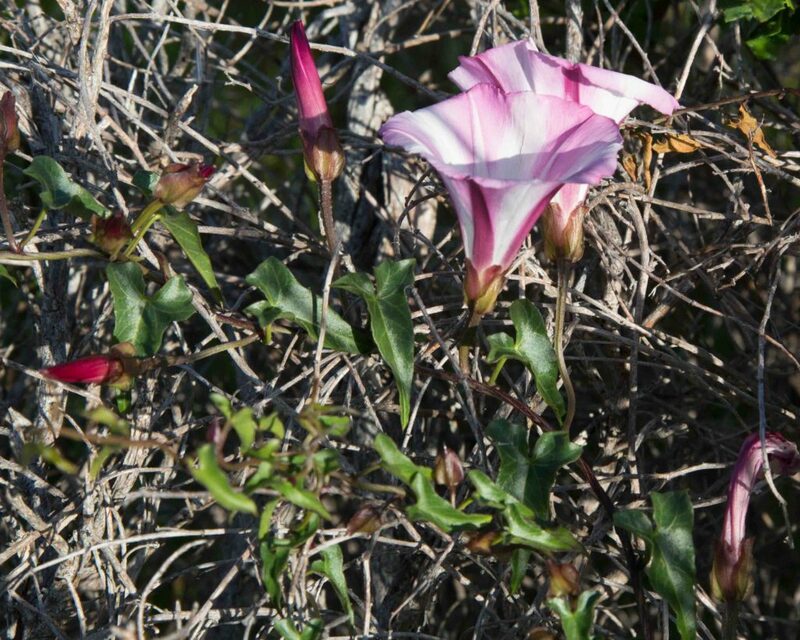 Otherwise known as Pacific False Bindweed. 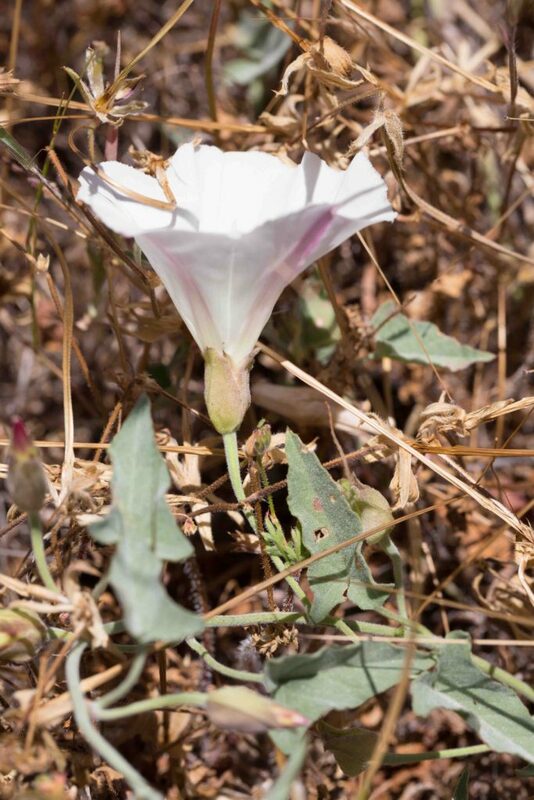 “Stemless” in the alternative common name is a slight exaggeration but the stem is very short, only about half the length of Hillside Morning-glory (Calystegia collina subsp. collina) with which this species can easily be confused. 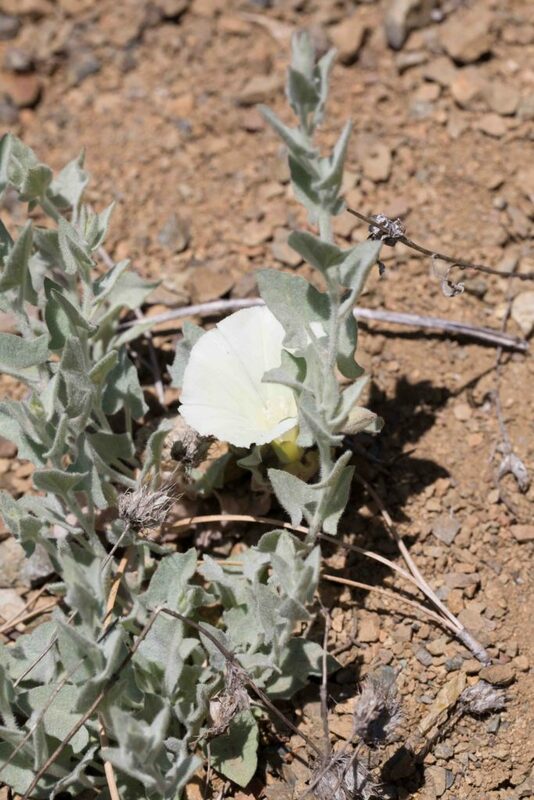 Both plants have stems that are decumbent to ascending. Leaves are variable, more or less triangular-hastate, sometimes with 2 backward pointing lobes, a tapered base and with an acute or rounded tip. Leaf margins may be either flat or more or less wavy. 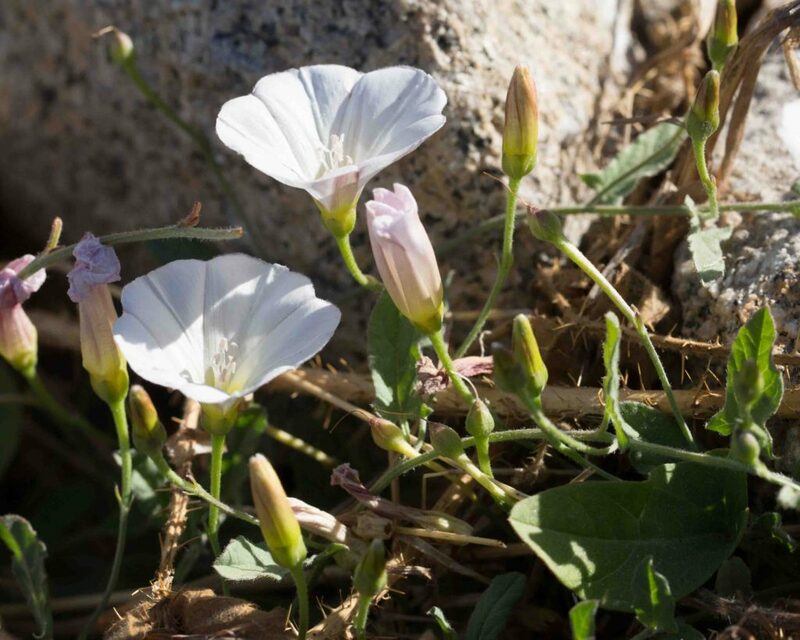 The plant can be hairy but is not tomentose like Hillside Morning-glory. 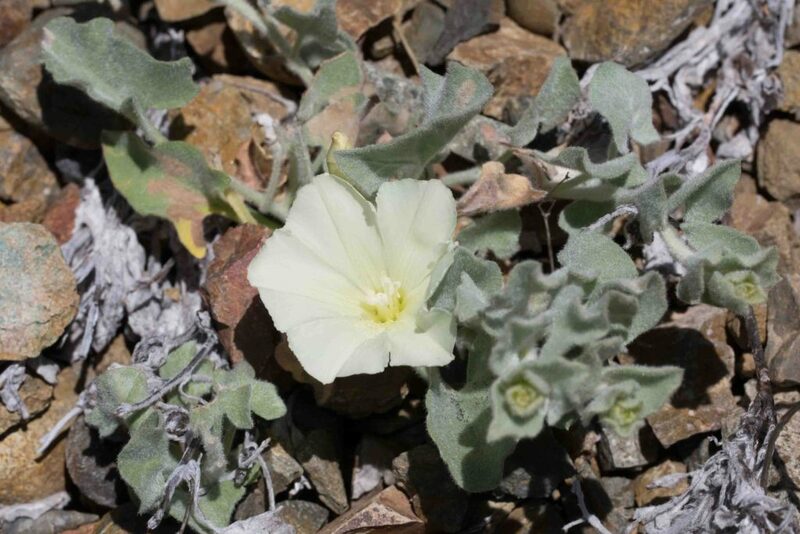 The flower is subtended by bracts which are narrow and equal in length to the calyx but do not conceal it. 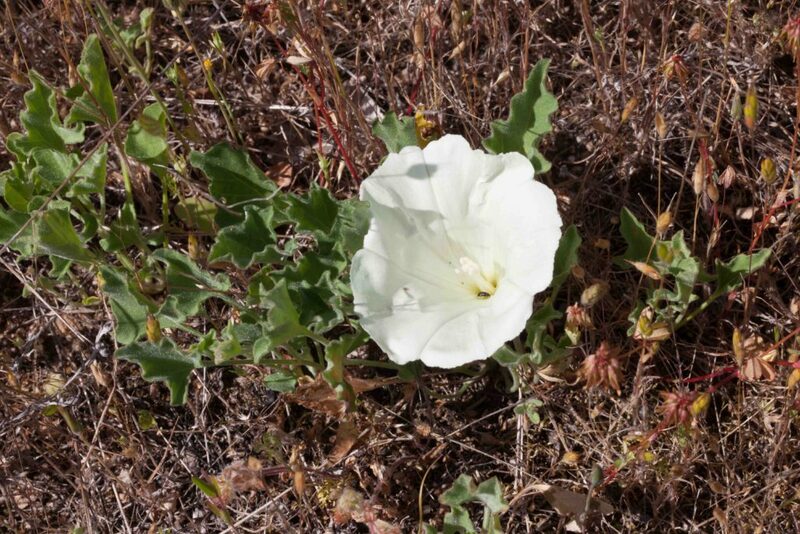 This can be difficult to distinguish with confidence from Hill Morning-glory (Calystegia subacaulis). 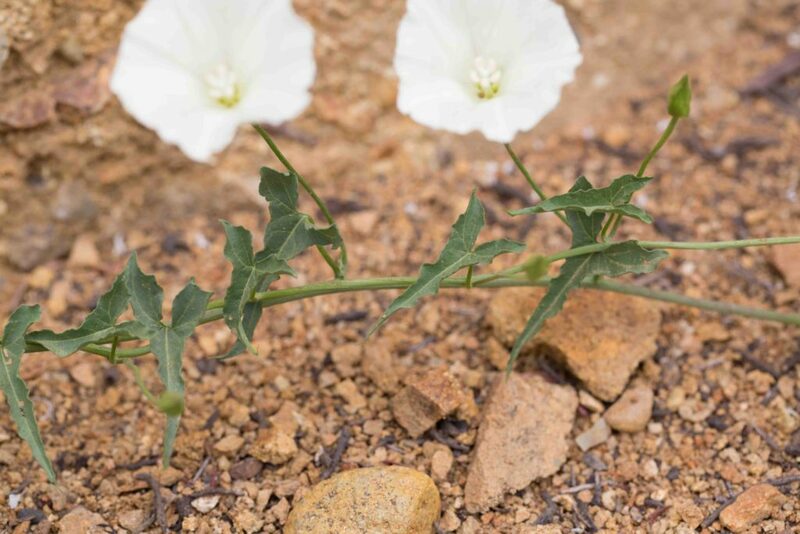 Its peduncles are also very short (< 6 cm) and its stems are also decumbent to ascending. 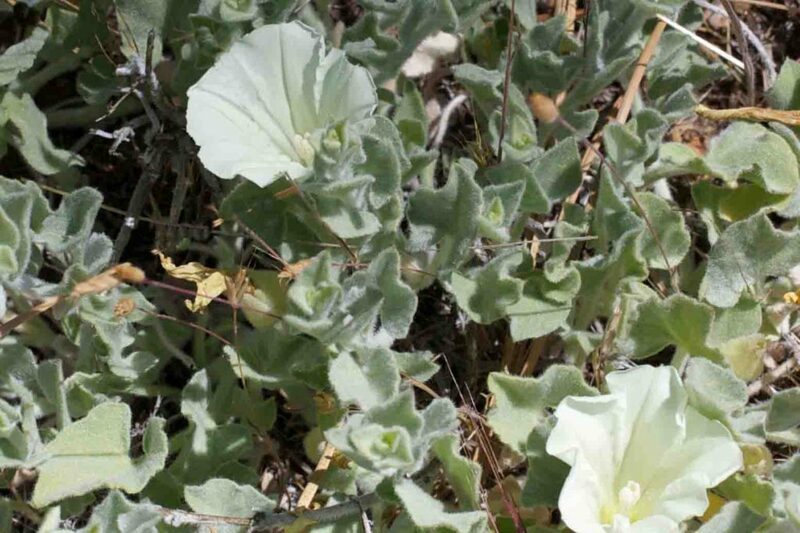 It is however clearly tomentose and its leaves are kidney shaped to triangular with indistinct lobes and wavy margins. 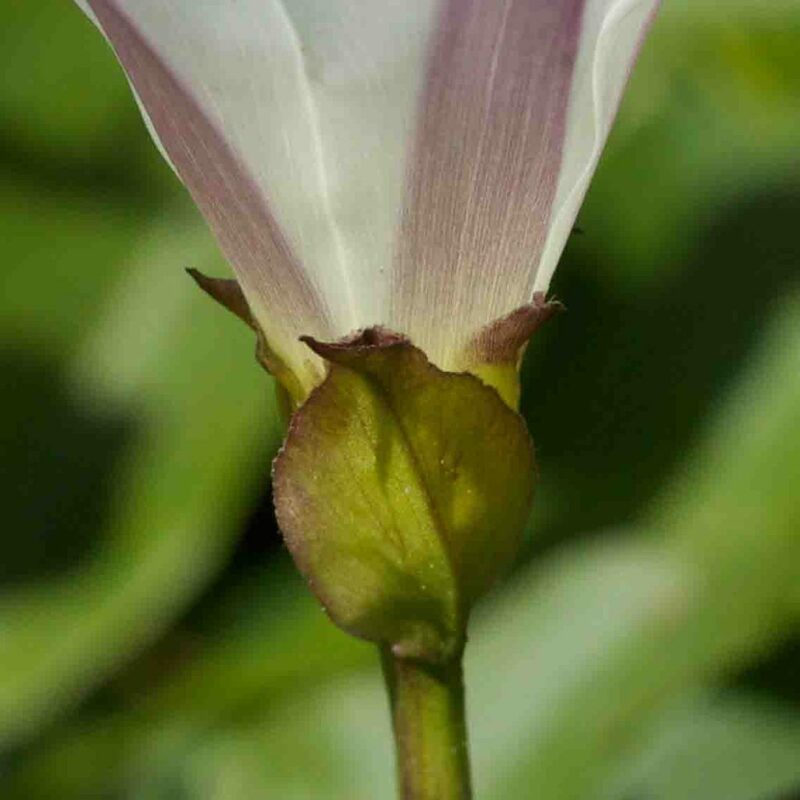 The bracts are widely ovate, more or less hiding the calyx although this seems not always to be the case. 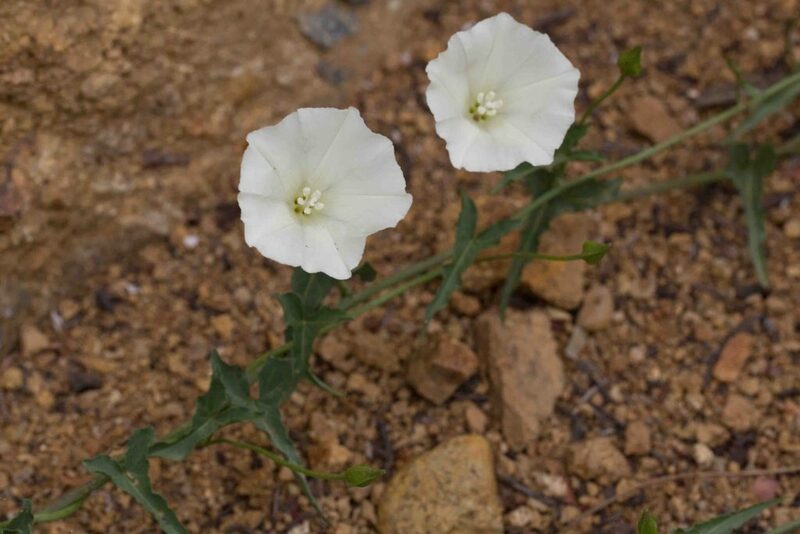 Very similar to Hillside Morning-glory (subsp. collina), but with some subtle differences and found only in the extreme south or south-east of the county. 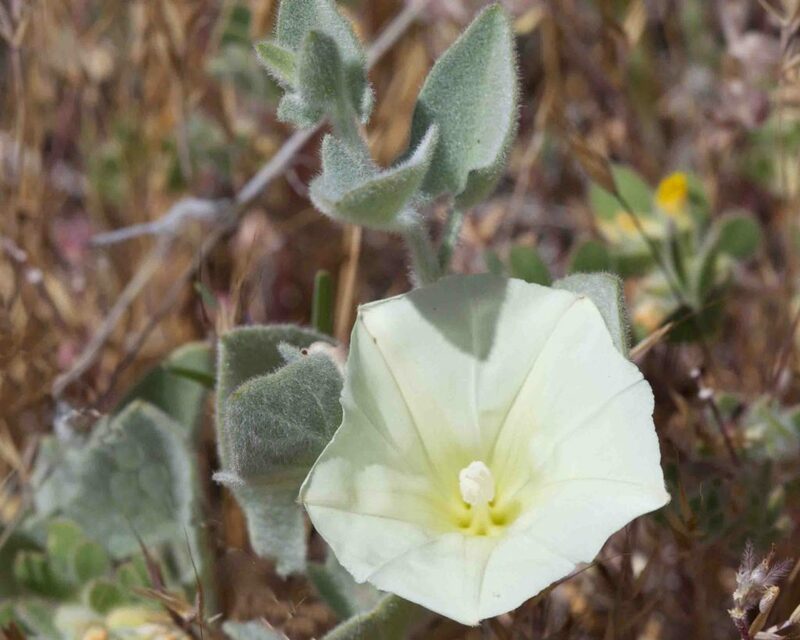 The plant is spreading-hairy to clearly tomentose with creeping stems, 8–30 cm long (twice as long as the stems on Hillside Morning-glory. 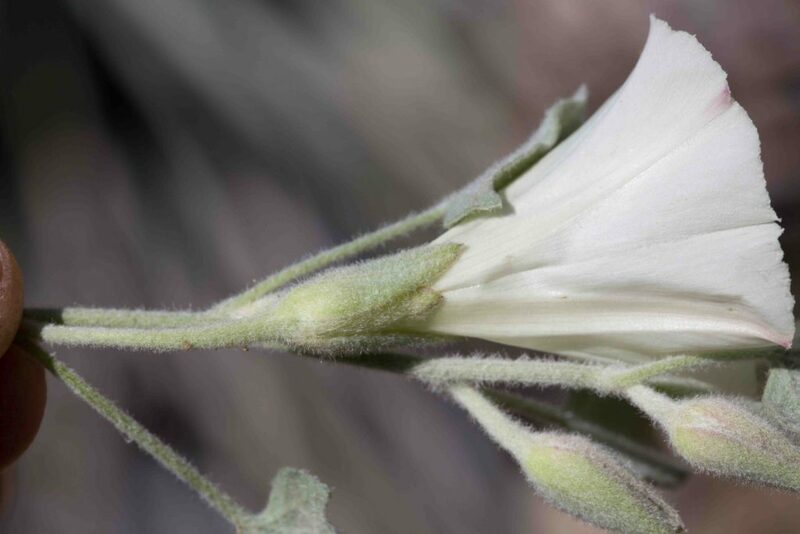 The bracts completely cover the calyx; sepal lobes are tomentose. 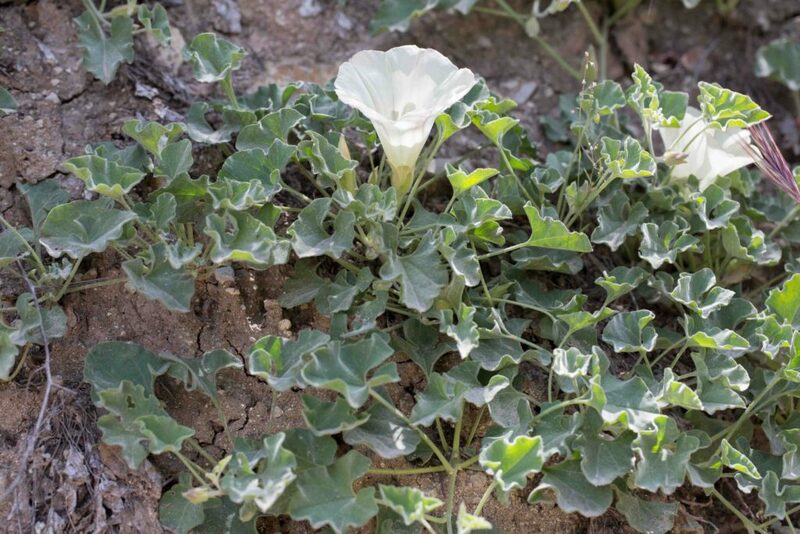 Leaves ares more or less triangular to kidney-shaped, with indistinct lobes or not. 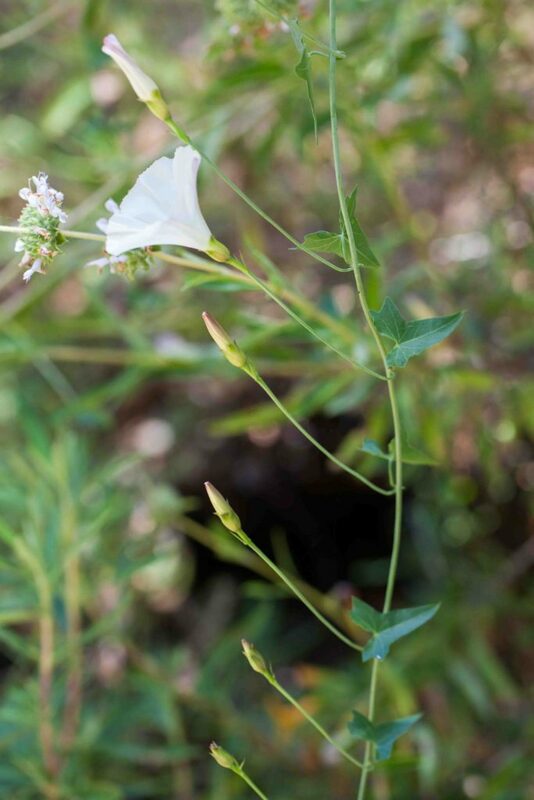 Like Hillside and South Coast Range Morning-glories (Calystegia collina), this is tomentose but, unlike them, it has well-developed stems and its leaves are not noticeably wavy-edged. 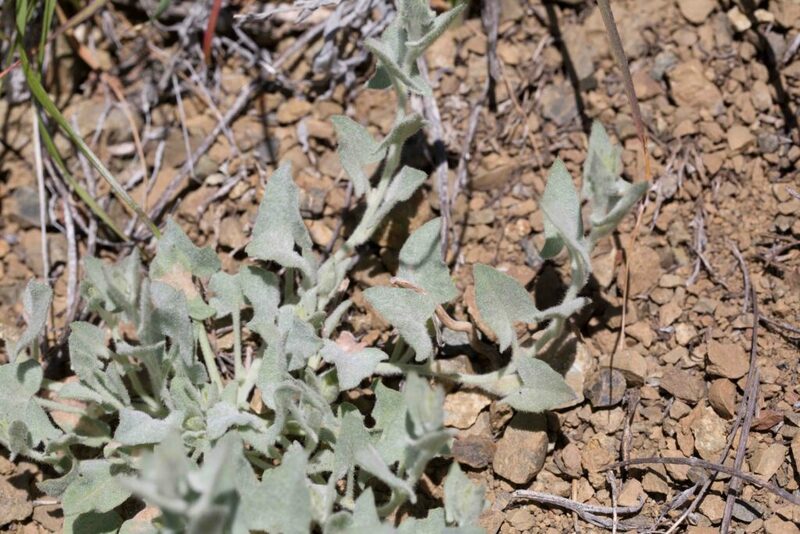 The leaves themselves are gray-green, narrowly triangular in shape with acute tips and single lobes. 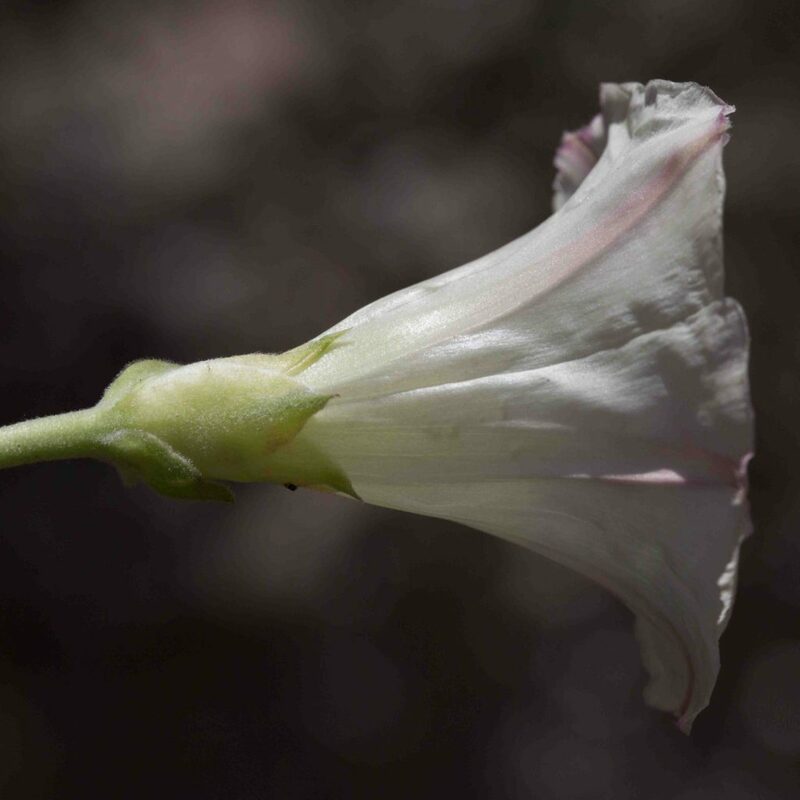 The bracts are ovate and generally more or less hiding the calyx. 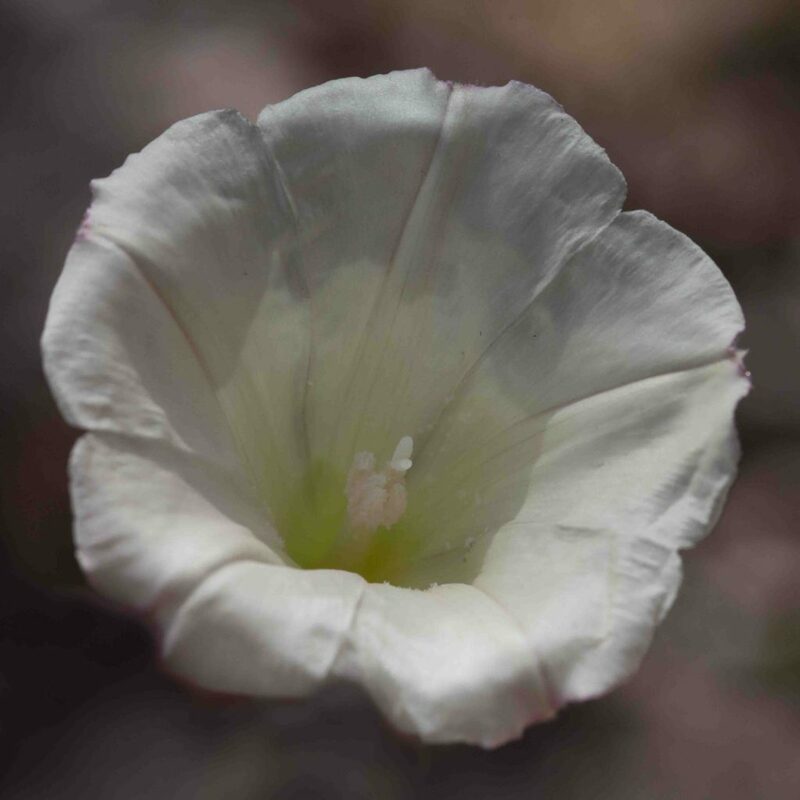 This Morning-glory is one of the few that is easy to recognize, partly from its location and partly from its distinctive, fleshy, kidney-shaped leaves, broader than they are long. 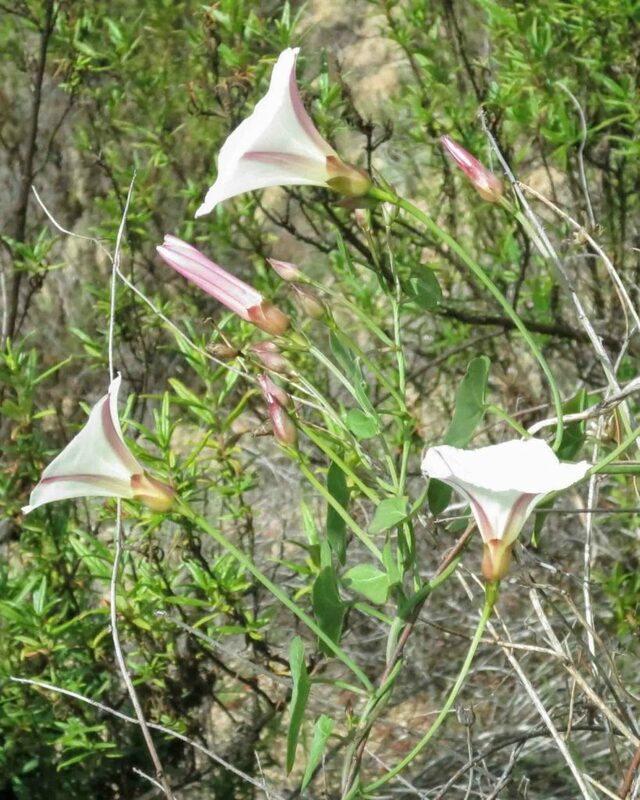 The flowers are more rose to rose-purple than white. 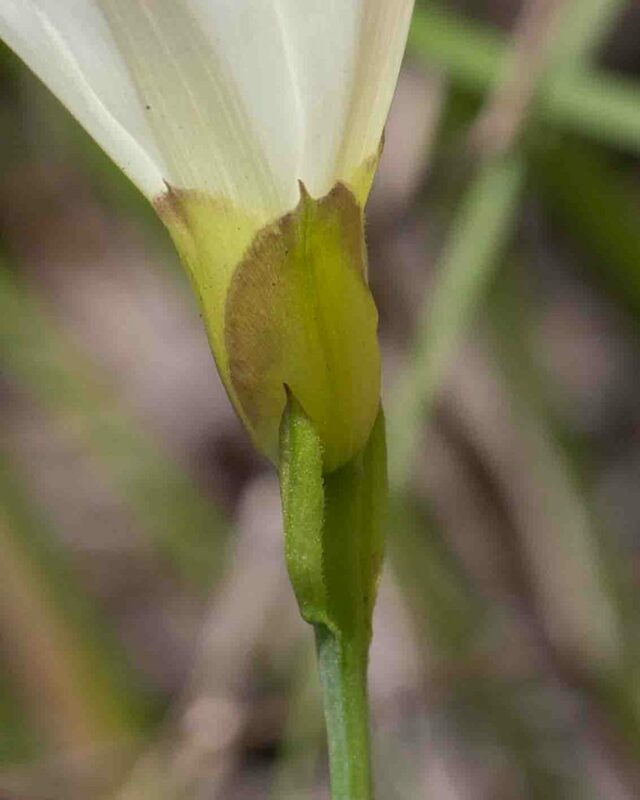 The bracts more or less cover the calyx and are obtuse or notched at the tip. 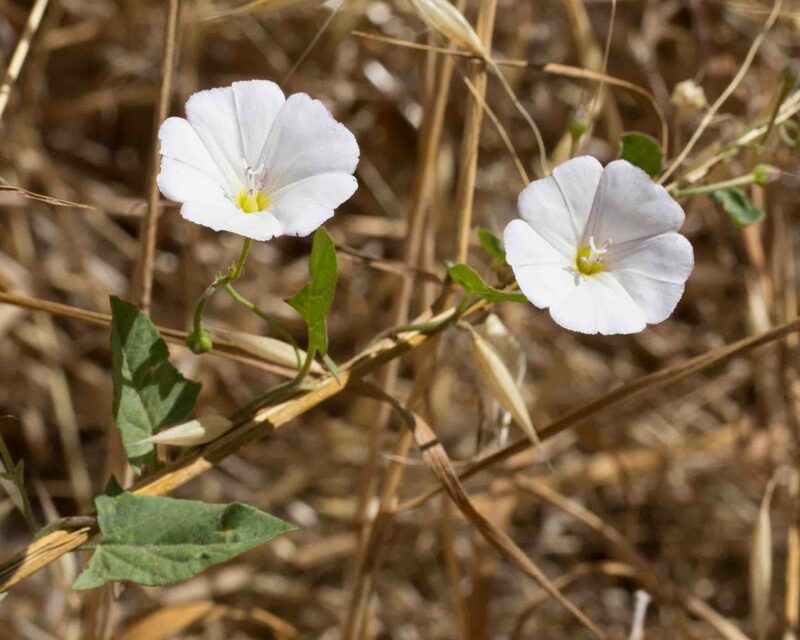 The only non-native among the Morning-glories found in the county. 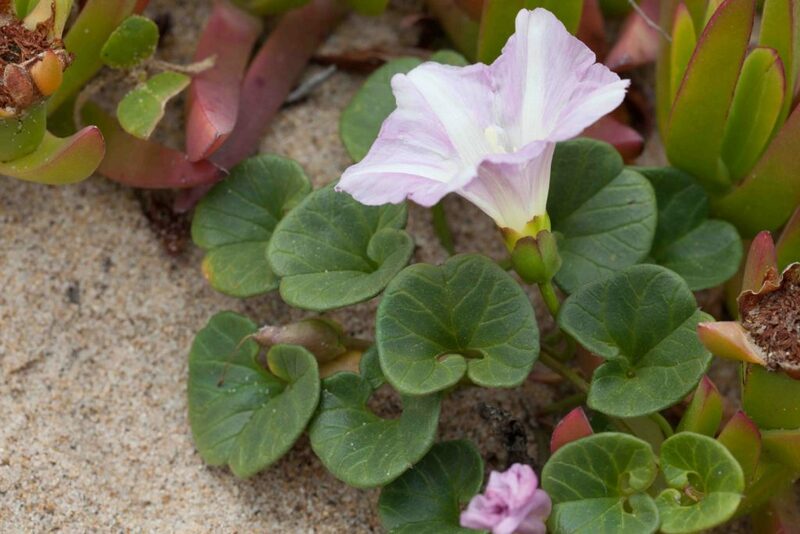 It has white to pink-tinged flowers, pink-striped below. 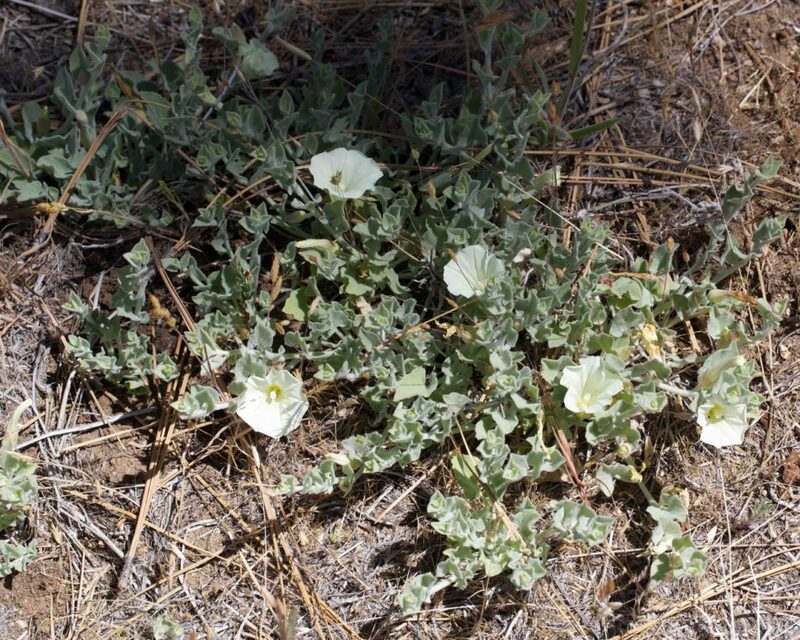 Its leaves are arrow-shaped with generally rounded tips. 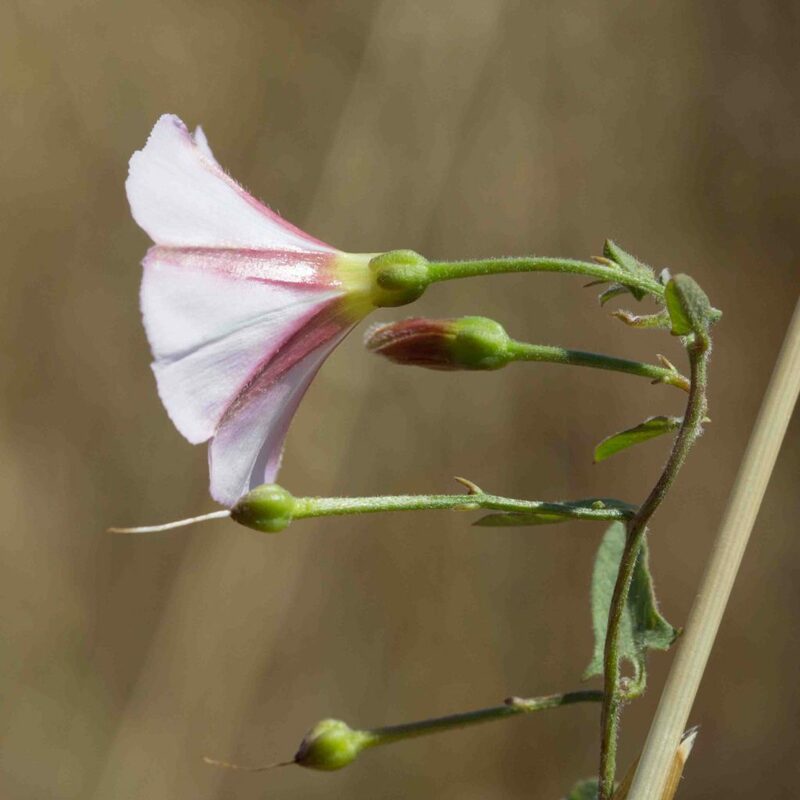 The slender bracts (linear to oblanceolate) are on the stem well below the flower. 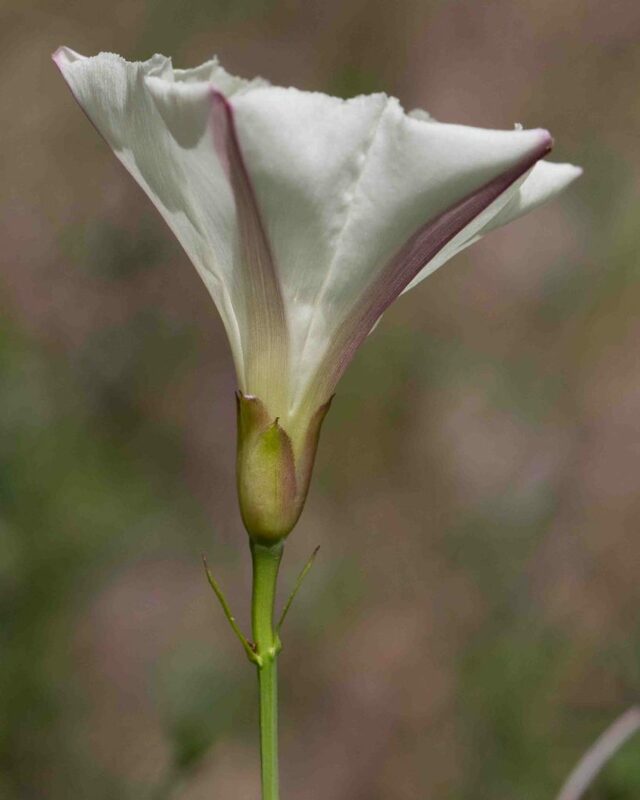 The stigma is linear to spoon-shaped and cleft. 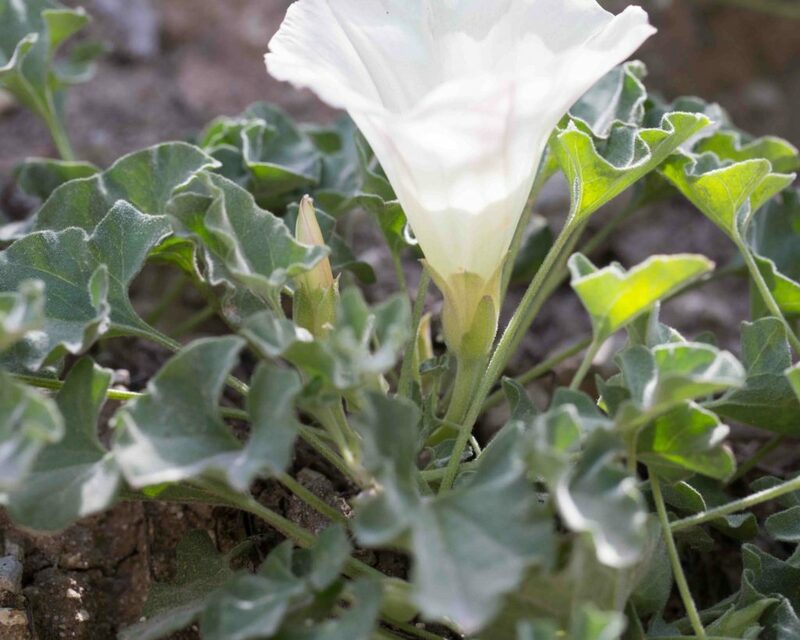 This plant is widely loathed by gardeners in its native Europe since its spreads aggressively, has deep roots and is almost impossible to eradicate.